Foreigners can study at the governmental universities in the Czech Republic free of charge - provided they pass successfully entrance examinations and they will study in Czech language. Some universities admit results of the studies abroad, in some cases excellent students having completed their studies at foreign middle schools can be accepted even without any entrance examinations. The Czech Open Institute has opened a project "czechschool". During one or two semesters, we will prepare you for your studies at a Czech university. 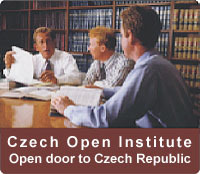 We will arrange all juridical requisites, teach you Czech and prepare you for entrance examinations. During all this period, we will provide you with board and lodging. We will provide the students with collaboration even during their university studies, for instance we will help to get various necessary documents or some extra-earnings to cover their board and lodging.